A few months back at my beat at Above the Law, I posed this question: Why Do Low Bono Work When You Can Start Your Own Non-Profit?. After all, if new lawyers are going to be offering discount rates, they might as well run the show and gain the advantage of being the boss, plus the opportunity to take advantage of loan forgiveness programs available to lawyers who work for non-profits. Curious about how this business model might work in practice? Look no further than Open Legal Services (OLS), an innovative Utah-based non-profit law firm started by relatively new lawyers and recently profiled in The Atlantic. 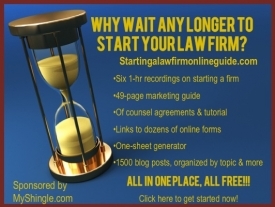 OLS charges sliding scale legal fees ranging from $50 to $135/hour. And while the rates are low, as a non-profit, OLS pays less in tax, can plus its lawyers are eligible for loan forgiveness after ten years – but as a private, non-government funded entity, OLS also avoids various bureaucratic reporting and record-keeping requirements. OLS-type models haven’t taken off of course because as non-profits, member lawyers aren’t going to get rich quick. Then again, if the future of law is in networks where lawyers commit to cut rates by 25 percent to participate in on-line platforms or offer unbundled services, they’re not going to get rich either and will still have to repay student loans. Maybe the non-profit law firm is a business model worth another look – particularly by those who claim an interest in access to justice.